يشكل فندق فندق أوكس إمباسي بموقعه الممتاز في منطقة سياحة, تسوق, مطاعم ضمن مدينة أديليد، مكاناً ملائماً لقضاء العطلة بعيداً عن عجقة أيام العمل. يمكن من هنا للضيوف الاستمتاع بسهولة الوصول إلى كل ما تقدمه هذه المدينة النابضة بالحياة. بالنسبة لمن يريد الخروج، هذه بعض المعالم السياحية المتوفرة للزوار ‪Holy Trinity Adelaide‬, كنيسة هولي ترنتي, ترافل سنتر جنوب استراليا. إن فندق أوكس إمباسي حريص على توفير الراحة للنزلاء، فلا يوفر الموظفون جهداً في تقديم أفضل الخدمات وضمان حسن الاستقبال. يمكن للنزلاء الاستمتاع بالميزات التالية: مكتب الاستقبال على مدار الساعة, مرافق مخصصة لذوي الاحتياجات الخاصة, تخزين الأمتعة, صف السيارات, رعاية أطفال أثناء إقامتهم في هذا المكان الرائع. في الفندق غرف نوم يتجاوز عددها 105، كلها مجهزة بعناية وجمال وبعضها مزود بـ اتصال لاسلكي بالإنترنت, حوض الاسترخاء, غرف لغير المدخنين, مكيف هواء, تدفئة. يمكنك طلب اللائحة الكاملة للخدمات في الفندق ومن بينها مركز للياقة البدنية, حمام سباحة خارجي, حمام سباحة داخلي. اكتشف مزيجاً ساحراً من الخدمة الاحترافية والخيارات الواسعة من وسائل الراحة والمتعة في فندق أوكس إمباسي. If you need a car park, they won’t respond if it is a request via Agoda, best to call to see if a car park is available. Lily at reception was really good when I called while parked out front and guided me to the ‘care park’ next door where she gave me a code to park. It’s an extra $20 per night. Room is clean, the small balcony has a view... of the brick wall of the car park next door lol it’s no big deal as we didn’t use the balcony but yeah, if a view is your thing. It’s called a hotel so I expected it to have the usual facilities, but it’s actually more like a serviced apartment. There are minimal toiletries and the hotel staff will send you to the convenience store up the road if you forget your toothpaste! There was no bottled water or mini bar, no room service or restaurant open at night. It’s fine, but not ideal for just a one night stay, especially if checking in late. You only get 30 mins of free wifi! Such a joke in 2018. It’s a nice place though, I’d recommend for a long term stay. this is the second time I have stayed here and have started using Agoda to book. It is a great hotel with comfortable rooms, the staffs were helpful and makes the stay easier. The location of the hotel is very central to where I was going for the conference. Check in and out of the hotel is very easy and quick. I will definitely stay here again the next time I am in town! We had a very good stay here, we came to Adelaide for Tasting Australia and stayed here 2 years ago for the same event. I contacted the hotel a few days before with the request that the larger of the two room be made up as a twin room, it was no problem, the room was well fitted 2 bedroom apartment, a little more attention could be paid to some maintainence issues, the bottom of the shower door needs deep cleaning and the top rack of the dishwasher has some parts missing on the running rail and rollers, this could cause an accident when emptying the dishwasher, we mentioned it on check out, we stored our bags as we were on a late flight out and enjoyed the rest of our last day in Adelaide, the staff here are very helpful and friendly, the only downside was when cleaning the room they never replaced the tea/coffee, a small thing but otherwise a great stay. Large family room, full kitchen & balcony!!!! 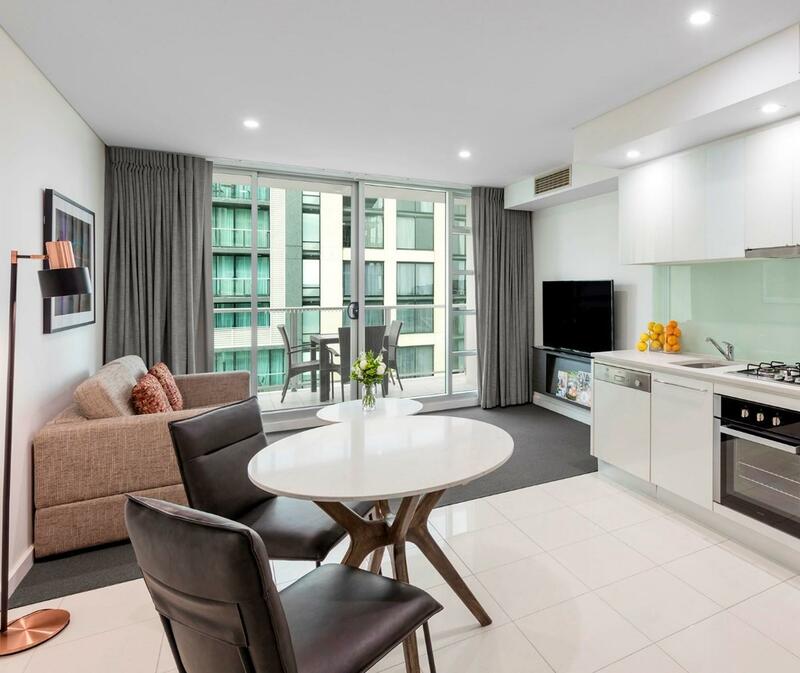 Had a great stay over the new year period, 2 bedroom apartment with all amenitites and great view over north terrace (perfect location to view fireworks however was not at the apartment at midnight). It was a pleasant stay. The room is clean & big. 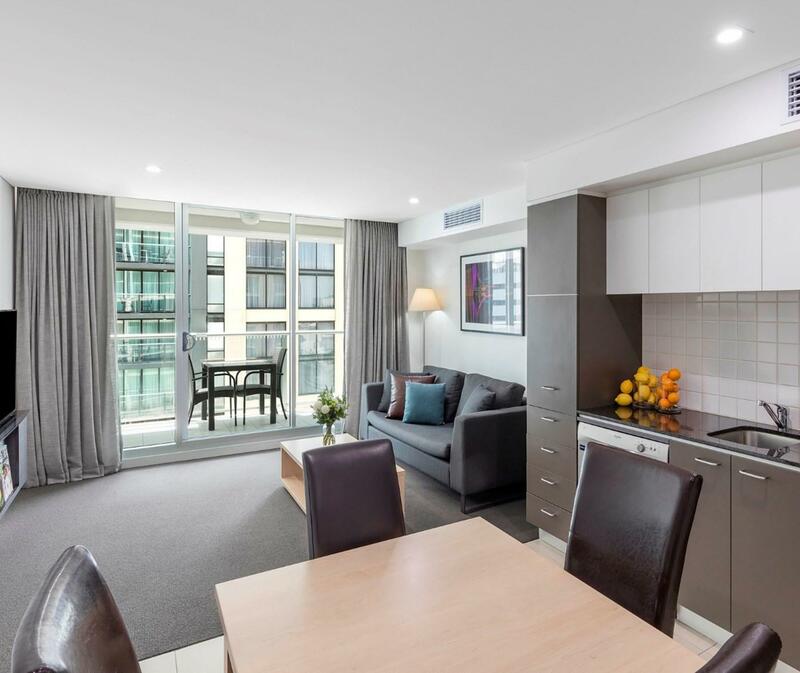 Location is really great, right in the middle of CBD and just across the railway station & Adelaide Convention Center. Lots of nice restaurant nearby. 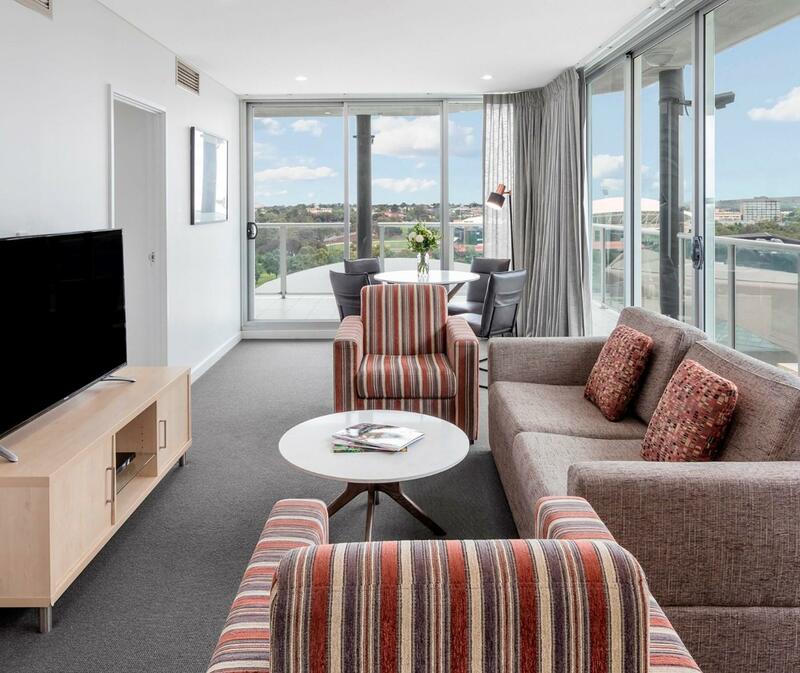 I will come back to this hotel again without doubts during my next trip to Adelaide. the hotel lobby is spacious and clean compare to others hotel nearby. the receptionist took quite long time to helped in checked in. I like the security service which need card to access to the main lobby after 9pm. Stayed here for two nights and found it an ideal base for the theatre and city. Good modern room, great spa, excllent views from 14th floor on big sweeping balcony. Good firm beds, Everything provided (except food BYO) Would stay here again. We were expecting a lot more but disappointingly were placed next to s smoker and cannabis user, making our spartment stink til he left. We got in the lift with him and he was completely off his face and looked very dodgy. The male staff member wasn’t fussed and only offered much inferior options rather than taking it up with him or giving us an equivalent soartmrnr. The furniture and fittings are very dull and cheap. Not what an executive or even delux room should offer. However, the view was nice. The apartment was very nice and spacious with a great kitchen but unfortunately the sofa bed in the living room was incredibly dirty so we couldn't use it. Also we were there for one week and the spa was out of order the entire time which was a disappointment. Last time we stayed here, it was a lot better. 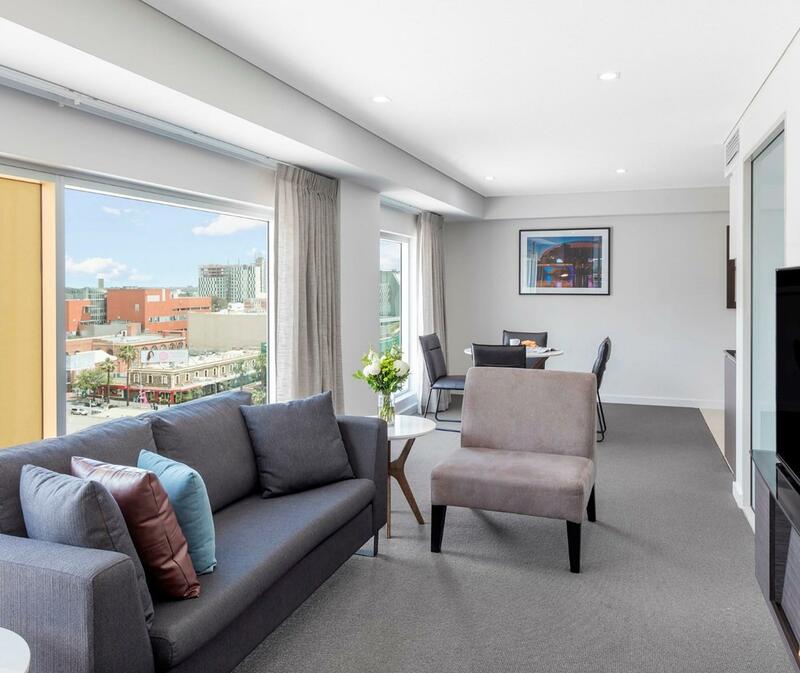 Two blocks from Rundle Mall, clean, separate bedroom from the TV room, nice balcony, great water pressure, good place for brekky in the building, and good security in the lobby - it was a GREAT place to stay. Drawbacks were minor - toilette seat wouldn't stay up, with isn't a problem for girls, but obligating one hand to the seat and the other to business was challenging. The balcony view from unit 604 wasn't worth writing home for. Couch was pretty uncomfortable. Again - minor issues. Great location! Spacious and clean. Well I am quite picky with my accommodations. But I do not regret for choosing Oaks Embassy at all. 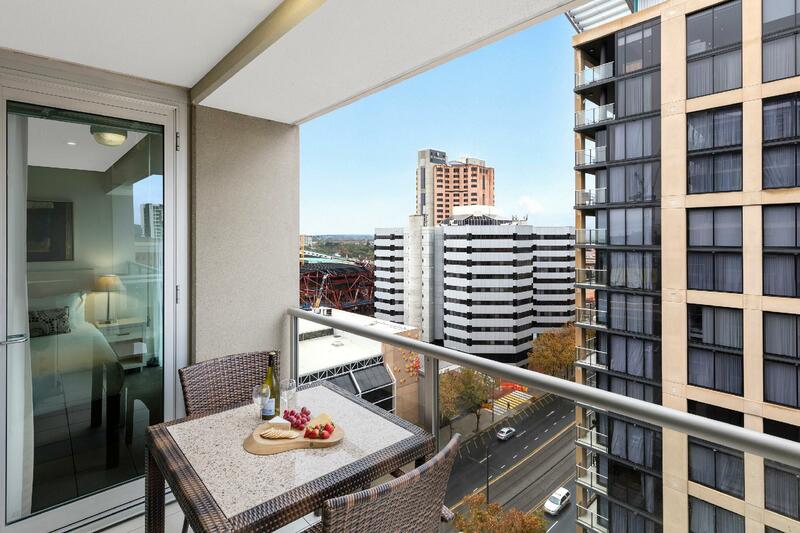 The location is strategically located in the city . My dad and my other family members were so happy with the place. They came for my graduation at Adelaide Convention Centre. I had no problem crossing the road . Highly recommended place!! It's like ur apartment concept. Excellent place. Okay so a small group of friends and I planned a last minute night out and needed a place to stay, we found that for a last minute decision it was a pretty good price for a two bedroom apartment split four ways it was even better, location was great and right next to where we wanted to be, if we were a few more levels up we could have watched the football game that was on that night, the condition of the room was excellent, the only downfall for us was that there wasn't enough power points and the docking station was only usable for one of the older generation iPods but that didn't bother us, the staff were great and we were completely satisfied with our overall experience. The accommodation is spacious but we found a few things broken which were fixed by staff. I found it a bit cold in atmosphere. The venetian. blinds did not work which was very annoying. My husband had a conference in the Convention Centre across the road. It was very noisy as well being situated on North Terrace.